We believe that the key to a Christian education is having Christ at the center of all learning, not as an add-on in the curriculum. Spiritual life involves every activity of the school, and teachers integrate a Christian perspective into all subject areas. While taking a holistic view of spirituality, we offer many specific and intentional activities to highlight the spiritual dimension of life. Elementary students receive daily Bible instruction using the Journeys with God Bible curriculum and attend a weekly chapel service at their level of understanding. 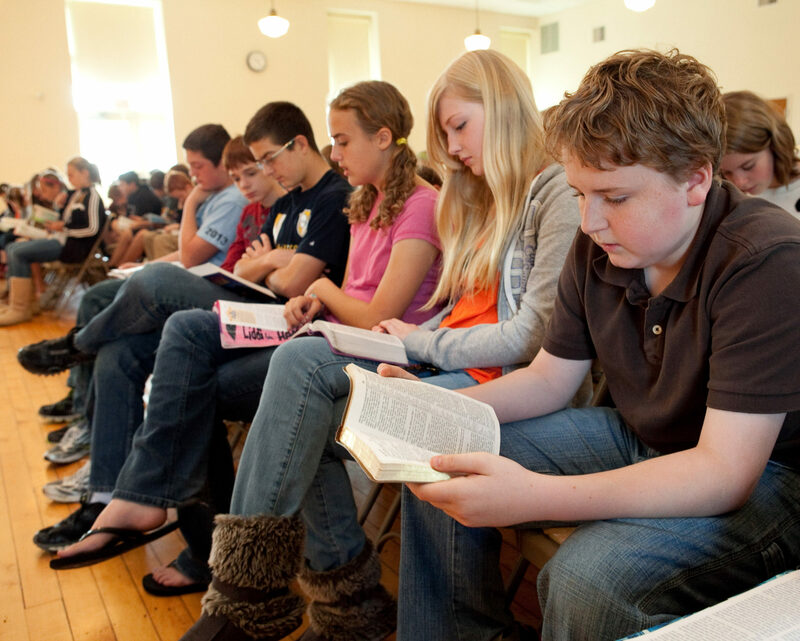 Middle school students generally attend Bible class twice every week, a weekly chapel service, and have extended times for focusing on their relationship with God. High school students attend chapel four times per week, meet one day per week in advisory groups and take a theology/Bible class each year. Students and faculty come from a variety of Christian congregations. Teachers, curriculum and chapel services emphasize a personal relationship with God through Christ, salvation through faith, and a commitment to following the life and teachings of Jesus. In this school students know they are loved and valued by God which enables them to value and love each other. Peacebuilding, including the use of restorative discipline, is regularly modeled and practiced as a lifestyle of nonviolence, seeking justice and being part of a reconciling faith community. Our school values and is responsive to cultural, racial and socio-economic diversity. Our school provides a welcoming community where it is emotionally safe to raise questions, to value and learn from differences, and to care for each other. The school enables students to practice global awareness, cultural sensitivity, anti-racism, and compassionate living. Students grow in their understanding of stewardship of all God has entrusted to them, including the natural environment. Staff members in our school are committed to modeling the life of Jesus Christ. Students grow in understanding the process of biblical discernment by asking questions, practicing spiritual disciplines, and engaging with other Christians. Students are encouraged to grow in relationship with Jesus and to follow Jesus daily in life through attitudes and practice. Our school does everything it can to eliminate the obstacles that exclude or hinder the ability of students to receive a faith-infused, education of excellence. Stories and symbols of faith and reconciliation are regularly shared in our school community. Our school invites parents to become partners in the faith formation of their child. Our school is a community that lives the gospel message through praying, serving others, and enabling students to grow in understanding that they can make a positive difference in the world globally and locally. Our school builds a strong faith and learning community in which students and staff support each other. Our school enables students to live a life of curiosity, wonder and mystery as they join with God to bring the reign of God on earth as it is in heaven. An international group of Anabaptists (Mennonite World Conference) developed this list of Shared Convictions. Anabaptist simply means “re-baptized” and refers to people who were baptized as adults during the Protestant Reformation upon confession of Christ as their Saviour and Lord. Mennonites are named after an early Anabaptist leader named Menno Simons. As a church, we are a community of those whom God’s Spirit calls to turn from sin, acknowledge Jesus Christ as Lord, receive baptism upon confession of faith, and follow Christ in life.